Duration: 5 tour days with 3 days of riding. Experience the incredible grip of spike tires in the Dracula Mountains. 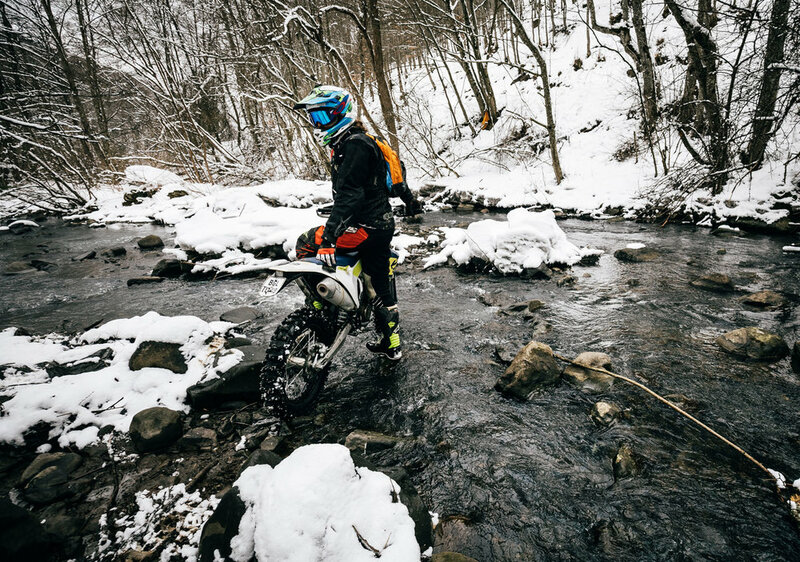 Discover how much fun it can make to ride in the snow. You cannot imagine which incredible grip you have with the spikes. Experience the beautiful winter landscape of the Dracula Mountains and relax in the evening in the SPA of our 4* hotel. The mountains in the Dracula Land offer perfect tracks for riding in the snow. We prepared tracks for all levels of riding so that also less experienced riders will enjoy biking in this incredible winter landscape. This tour has a 5 day duration with 3 riding days. Day 1 – Arrival in Sibiu and transfer to the hotel in the Dracula Mountains. Day 2 through 4 – Guided all day Enduro tours. Day 5 – Departure from Sibiu. The difficulty level is accommodated during the rides to the riding level of the group. Best time for Winter Fun is in February where we find a good mix of moderate temperatures and good snow conditions. The airport for arrival is SIBIU. You will be picked up at the gate and transferred round 2 1/2 hours in a comfortable van to the hotel in the Dracula Mountains. Our hotel is located in the center of a small town and offers a good comfort and a Spa with massage. For dinner we go to restaurants in the city nearby the hotel. Breakfast and dinner are included. For lunch we stop at very good restaurants on the way. Drinks are not included. 3 guided Enduro tour days. 4 overnight stays with breakfast in shared rooms. Riding in groups with different riding level, so nobody is overloaded and everybody gets a maximum of Enduro riding. Service car stand by with spare parts, and spare bike. Tour manager during the whole tour duration. RideXpower function shirt, diploma, and a small present. Individual arrival and departure, CDW (insurance for the damages on the rental bike), lunch, drinks, personal insurance, travel cancellation cover. A tour manager will pick you up at the Airport Sibiu to welcome you and will be with you all the tour. On this tour, a rental bike can be booked as option. We have KTM and Husqvarna 2- and 4-stroke injection models available no carburetor bikes. All bikes are the latest models, professionally serviced, and in excellent condition. The bikes come with tyre in good condition with mousse and are equipped with closed rally guards, motor skid plate and fan. Professional mechanics service with spare parts and spare bikes is available if needed. An option for new Mitas tyre offered. On all bikes mousse in front and rear are fitted. Book the RideXpower BikeXpress from the UK, Belgium, Netherlands, Germany and Austria to Sibiu and back, Other pickup/drop-off destinations are available on request. Please contact us for the tour price without a rental bike. Rental gear available on request. Deposit 350 EUR at booking and the rest 60 days before tour start.